This famous song illustrates how much the Schubertian lied owes to the opera house. The music is modelled on the Classical formula of an operatic scena, where recitative is followed by an andante aria which, in turn, is capped by a cabaletta in faster tempo. As a result, this is arguably a rather stagy set-piece, lacking the spontaneity and naturalness that characterize most of the great Schubert songs. But unlike some of Schubert’s other cantatas, it has the advantage of concision, and the operatic mould is broken by a breathtaking return to the andante aria (‘Ich wandle still’) which is perhaps its most poignant feature. If Schubert’s opera-going had fired his imagination, his youthful apprenticeship as a composer of ballads had been equally crucial. Without having worked on all those long and episodic early works, it is unlikely that he could have written a mini-cantata like this, made up of different elements, at the same time as preserving a strong sense of unity. 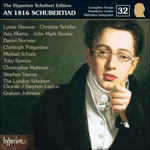 Der Wanderer captured the public’s imagination like few other Schubert songs. Only Erlkönig could rival its reputation in the composer’s own lifetime. It had everything for a popular success: it was of manageable length; it was decently performable by amateur singers and pianists; it contained that element of theatricality dear to would-be artists, which casts the singer as a noble victim of fate; and the text, though not great in itself, seemed a perfect expression of the romantic Zeitgeist. It still seems relevant, although Schubert regularly set much better poems than this. The tragic events of the twentieth century – war and genocide on a scale undreamed of in the nineteenth century – give these words a new resonance (in the same way as the longing to return home of Goethe’s Kennst du das Land? seems more powerful in the wake of the Second World War). Added to this, the works of Sigmund Freud and his disciples have made us all conversant with neurosis, introspection and the psychological effects of alienation. The wanderer is more likely to be one of us than a shadowy picture painted by Caspar David Friedrich. Indeed, with the sophisticated means of travel available to us today, even the itinerant concert artist is no stranger to feelings of disorientation and emptiness, the longing for home and for the sound of his own language. The song begins with throbbing right-hand triplets in the piano – this much, as well as its worldwide popularity, Der Wanderer has in common with Erlkönig. But the drama is generated by harmony rather than rhythm. (The song is marked ‘Sehr langsam’, although an alla breve time-signature keeps the music flowing.) The right hand plays hushed C sharps in triplets, while the left, deep in the bass clef, spells out the first three notes of a C sharp major arpeggio: C sharp – E sharp – G sharp. There is something typically Schubertian about the way a song in the minor key begins with a major-key harmony. Each bar begins on this low C sharp pedal and climbs in different directions; bar by bar the right hand makes tiny changes beneath the hand to vary the harmonies of those triplets – a D natural is added to the single C sharps to make a minor second which then opens out into three notes in a diminished chord for the third bar. The widening harmonies are a metaphor for a slow but inexorable rising tide, a stain of grief which spreads slowly over the stave and seeps into the fabric of the song. And so it continues: the diminished-seventh harmony, aided by a crescendo, leads to a new outpost – F sharp minor in second inversion. The right hand then moves to another diminished chord on the C sharp pedal – four notes in the right hand for the first time. This built-in intensification adds to a sense of deepening doom. And then we are back to where we began, in C sharp major, and once again piano; having surveyed the bleak emotional landscape of the wanderer’s mind, the pianist can find no avenue of harmonic escape. It is astonishing how much, and how little, can happen in thirty seconds of music. The entry of the singer ushers in a sequence of short phrases where he tells us that he has come from the mountains and now finds himself between valley and sea. ‘Ich komme vom Gebirge her’ is a weary unaccompanied trudge up the stave where the dotted rhythms shudder with the infinite weariness of a noble and tortured soul. This initial fragment of recitative lifts the musical argument into a higher tessitura; the following interjections (the oppressive weather-report of ‘Es dampft das Tal’ and ‘es braust das Meer’) are sung – separated by an eloquent gap – against a background replay of the opening six bars, hiked up a perfect fourth to F sharp minor. This means a rise in tension which is abetted by the sudden forte outburst of ‘es braust das Meer’; a fortissimo repetition of these words leads us back into C sharp minor. For the second time in the song we have come full circle, a metaphor for the fate of the wanderer himself: all the rich harmonic scenery has taken us no further on our journey. A two-bar interlude of right-hand triplets and solemn left-hand minims makes the connection between C sharp minor and E major with gravity and unhurried nobility. As the change to E major takes place, the piano’s bass line vanishes, leaving etiolated triplets in the right hand over which the voice emerges in legato tones, infinitely sweet and long-suffering – ‘Ich wandle still, bin wenig froh’. This beautiful fragment of tune makes us realize that eloquent piano writing from the beginning had led us to mistake accompanied recitative for real melody, and is the first real test of the singer’s art. This is a classic example of Schubert’s use of the major key to convey suffering, and it confirms the status of the wanderer as a forerunner of the winter traveller. (The haunting and confessional mood of Der Lindenbaum, also in E major, comes to mind.) Deep in the cello register, the left hand of the piano echoes the vocal line of ‘Ich wandle still’ – this is a real colloquy between voice and piano as if the singer were communing with an inner voice which prompts, guides and haunts him. Mention of a sigh (‘Seufzer’) brings the vocal line into a higher register than before: those Es and D sharps in a pianissimo dynamic are a real challenge for those with voices deep enough to negotiate the lower passages. ‘Immer wo?’ is especially testing: these notes oscillating at a distance of a semitone suggest someone trying in vain to focus, scanning the horizon for an answer to an unanswerable question. The sighing and angst of the text are built into the music’s technical demands. This section ends with a fermata, in G sharp major. This ushers in the arietta in C sharp minor (beginning ‘Die Sonne dünkt mich’) which lies at the heart of the work. The dactylic rhythm of the accompaniment is the inspiration for the ebullient opening of Schubert’s Wanderer Fantasie for solo piano D760 of 1822, but it is only in the slow movement at the heart of that work that we hear the magisterial elaboration of the eight-bar harmonic sequence which John Reed calls Schubert’s ‘Sehnsucht’ motif. Otherwise the Fantasie is a celebration of energy and virtuosity which transcends the pain and solemnity of the original. Schubert employs dactyls to depict forces of nature; in Der Wanderer this rhythm (long-short-short) seems to denote the withdrawal of the life force giving light and heat. Apart from gloomy links with Der Tod und das Mädchen it is noteworthy that the image of faded or withered flowers (‘Die Blüte welk’) is embedded in a dactylic dead march; in Trockne Blumen from Die schöne Müllerin dead flowers inspire a similar tonal analogue. This traveller is not just a victim of bad luck; he is doomed to a living death like the Flying Dutchman, or the Wandering Jew. The vocal line seems almost rooted to the spot; it pivots around G sharp in obsessive and repetitive fashion. ‘Ich bin ein Fremdling überall’ is inexplicably poignant. Twice the vocal line stretches upwards – once at ‘ein Fremdling’ and again at ‘überall’. In this rise and fall there is the infinite sadness and vulnerability of a noble man. (Schubert makes much use of the power of these intervals in the Wanderer Fantasie.) The technical difficulty for the singer (who risks cracking the higher notes) adds to the tension of the moment. This eight-bar passage, in itself, is hardly the equal of the opening page, although its mood of bleak depression and emptiness (ideal for ‘leerer Schall’) is expressive in context. The next section (marked ‘Etwas geschwinder’) depends on a fine performance to avoid banality and the impression of a trite, rum-ti-tum march. The pianist has to ensure the imploring nature of the chords in thirds which are phrased away in a dying fall. These accompany the singer’s impassioned questions – ‘Wo bist du, wo bist du, mein geliebtes Land?’. The change between A major and A minor following the word ‘geahnt’ is a classic Schubertian illustration of a dream dissolving into disillusionment. At this point the song links hands with the Die Götter Griechenlands, an A major/minor song of 1819 where dotted rhythms invoke, and fail to summon, another lost land, the ‘schöne Welt’ of ancient Greece. The repeated words ‘Wo bist du’ are common to both songs. The wanderer is now getting into his stride. At the song’s beginning he seems scarcely to have had the energy to embark on a description of his surroundings. As the music moves into a different rhythm, and a faster tempo still (‘Geschwind’ in 6/8), he becomes vehement in his description of what he has lost. This is incidentally often sung and played at a ridiculously fast tempo which nullifies the gravity of the character at a stroke, especially if the words are unintelligible. In unsafe hands the Viennese waltz (beginning at ‘Das Land, wo meine Rosen blühn’) can seem a disconcertingly jolly affair. This is surely an ironic early use of the cosiness of dance rhythm, as in the unhinged waltz of Täuschung from Winterreise which depicts the brightly-lit, human world from which the winter traveller is excluded. Unfortunately the poem is at its weakest here: if the rhyming of ‘so hoffnungsgrün’ and ‘wo meine Rosen blühn’ (the wanderer as displaced gardener!) seems corny, the roaming of friends (‘Freunde wandeln gehn’) paired with the resurrection of his dead relations (‘Wo meine Toten auferstehn’) seems even more ungainly. The rising sequence of harmonies (C sharp major – F sharp minor – E major – A minor) culminating in ‘das meine Sprache spricht’ implies that the absence of his home language is the last straw, the most terrible blow of all. The anguished cadence into E major (‘O Land, wo bist du’) interrupts the jingle at the right time: Schubert sweeps away the second half of Schmidt’s rhyming couplet (‘Und alles hat, was mir gebricht’) in favour of a rhetorical question of his own devising. This ushers in the concluding section marked ‘Wie anfangs, sehr langsam’ (‘As at the beginning, very slow’). It is here, above all, that Der Wanderer seems to justify its reputation. Three bars of piano interlude move solemnly from E major, and back again to the same key, via F sharp minor. Schubert invests this interlude with such magisterial dignity and pathos that the wanderer’s plight seems genuinely moving. Those exposed E major thirds, once again pulsating in the pianist’s right hand, symbolize his vulnerability. As the haunting melody of ‘Ich wandle still, bin wenig froh’ is once again superimposed on this background we feel ourselves in the presence of a masterpiece. The skilfully engineered recapitulation of this music gives a symphonic (and thus larger than life) dimension to what might have seemed, in other hands, merely sentimental. Once again the wanderer sighs his rhetorical question, ‘wo?’, on a high-lying line where D sharps and Es nudge each other in the head voice. The final section is in eight bars where there is a return to the elements of a recitative. At ‘Im Geisterhauch tönt’s mir zurück’ piano and voice descend the stave together into the nether regions (‘zurück’ requires a low, resonant G sharp). These hushed unisons usher in the last of the poem’s challenges to the singer: a phrase in inverted commas spoken, or rather sung, by the ‘Geisterhauch’ itself, the grim voice of fate, or perhaps the wanderer’s own inner voice, the self-punishing anguish that drives him on. The answer to the wanderer’s ‘immer wo?’ encapsulates the horror of his predicament; he learns that happiness can only exist where he himself is not. The downward B major arpeggio on ‘Dort, wo du’ seems a thumbs-down answer to the questing three-note motif of a rising arpeggio with which the song began. ‘Dort ist das Glück!’ (the repeat of ‘Dort’ is Schubert's decision) is only a conventional 6-4 cadence but, spread over three spacious bars, it is among the most impressive that Schubert ever penned. It is the lucky singer who can convincingly encompass the low E of the final ‘Glück’, the very depth of the tone negating the word’s meaning. (The composer provides an ossia where the upper E is also allowable.) The three-bar postlude is a moving miniature commentary on the sadness of this situation; it reflects elements both of the protagonist’s world-weariness and resignation and the composer's compassion. Only Schubert would have had the courage and imagination to end such a manifestly masculine song with the dying fall of a feminine cadence. This poem, the creation of an otherwise obscure writer achieved limited fame in its own time and was much anthologized in various almanacs. Schubert came across a version of it in Deinhardstein’s Dichtungen für Kunstredner. There it had the title of Der Unglückliche (not to be confused with the Karoline Pichler setting of the same name) and was falsely ascribed to Zacharias Werner. Certain lines of the poem exist in various versions so it is not clear whether adaptions were made by the composer himself. (The version printed in the 1826 edition of Schmidt’s Gedichte, published near Hamburg, is illustrated here; Schubert’s song seems not yet to have penetrated those parts.) The work’s title was Schubert’s own. The three versions of the song are similar to each other: the first dates from 1816, the third from when Schubert prepared the work for publication five years later. The second version is the composer’s own transposition into B minor, proving that the vocal challenge of this song has always been in the higher, rather than the lower, reaches of the stave. 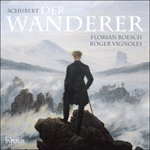 Standing as an epigraph to Florian Boesch’s recital is Schubert’s famous 1816 setting of Der Wanderer by Georg Philipp Schmidt (known as ‘von Lübeck’ to distinguish him from other versifying Schmidts). In the composer’s lifetime this splendid, rather theatrical outpouring of Romantic gloom and (above all in the aching major-key music of ‘Ich wandle still, bin wenig froh’) pathos—perfectly in tune with the spirit of the times—was a favourite in Viennese salons, its popularity rivalled only by Erlkönig. Le récital de Florian Boesch s’ouvre sur le fameux Der Wanderer, d’après un poème de Georg Philipp Schmidt (dit «von Lübeck» pour le distinguer des autres Schmidt poètes). Du vivant de Schubert, qui en composa la musique en 1816, cette effusion splendide, assez théâtrale, de mélancolie romantique et (surtout dans la douloureuse musique en mode majeur de «Ich wandle still, bin wenig froh») de pathos—en parfaite adéquation avec l’esprit du temps—avait la faveur des salons viennois, seul Erlkönig lui disputant alors sa popularité. Der Wanderer wurde als Epigraph zu Florian Boeschs Vortrag ausgewählt—die berühmte Vertonung Schuberts aus dem Jahre 1816 des Gedichts von Georg Philipp Schmidt (der als „von Lübeck“ bezeichnet wird, um ihn von den anderen dichtenden Schmidts zu unterscheiden). Zu den Lebzeiten des Komponisten war dieser großartige und recht theatralische Ausdruck von Pathos und romantischer Schwermut (insbesondere in der schmerzvollen Dur-Musik bei „Ich wandle still, bin wenig froh“) völlig im Einklang mit dem Geist der Zeit und ein Lieblingsstück in den Wiener Salons; nur der Erlkönig erfreute sich einer vergleichbaren Popularität.